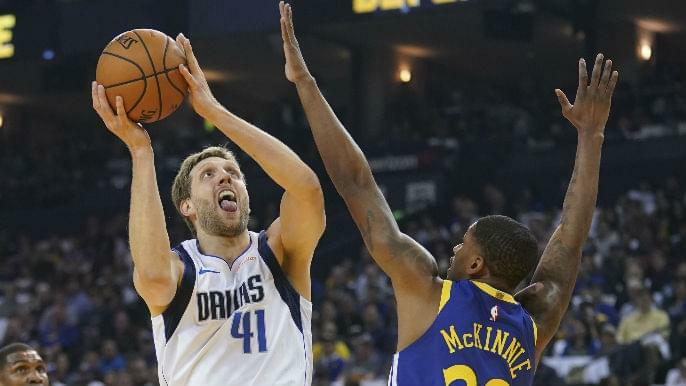 OAKLAND — The visiting Dallas Mavericks trounced the Warriors, 126-91, Saturday night. Here are three thoughts. The Warriors had been on a defensive tear, allowing 99.8 points per game on average over their last five entering Saturday. On Thursday, they held the Indiana Pacers to 89 points, the second-fewest scored against Golden State this year. Prior to Saturday’s game against the visiting Dallas Mavericks, Steve Kerr was asked whether he feels his team has turned a corner defensively. He said he had. A couple hours later, the Warriors got lit up, by the 21st-ranked scoring team in the NBA. The Warriors’ rotations were slow, contrary to Thursday night. They struggled to locate open shooters defensively, as rookie Luka Doncic completely controlled the game. Dallas, ranked 27th in the NBA in three-point shooting with a 34.1 percent clip, made 11 of 18 threes in the game’s opening 16 minutes. The barrage came everywhere, from Doncic, to Dirk Nowitzki, to substitute forward Max Kleber, who channeled his inner Nowitzki with high-post fadeaways. The play befitting Dallas’ dream half came in the second quarter, leading Golden State, 48-28. With the shot clock ticking down, and Andre Iguodala hounding Mavs guard Devin Harris at the top of the key, Harris pump-faked a couple times, looked elsewhere, then realized he had to shoot, and… swish. The Warriors collectively threw up their hands. Offensively, the Warriors, without a resting Stephen Curry, struggled to find open shots. Kevin Durant was aggressive early on, but he made just four of 12 shot attempts in the first quarter. He attempted 22 shots in the entirety of the previous two games. Aside from DeMarcus Cousins, no other Warrior found an offensive rhythm. Klay Thompson, who missed his first eight shots Thursday night, sunk into a similar early-game slump Saturday. He went 0-4 in the first quarter. He ended with just eight points on 4-13 shooting. Without Curry, the Warriors managed 22 assists to Dallas’ 33. The Warriors suffered from a miserable three-point shooting night, connecting on just four of 29 three-point attempts. The Curry effect was real. For a bottom-tier team, the Mavericks sure have a pair of must-see attractions, for largely opposite reasons. Doncic is one of the league’s brightest young stars. Kerr said pregame that Doncic is a future All-Star. Nowitzki is a 14-time All-Star on a farewell tour that the entire NBA has embraced. Both were celebrated Saturday. Nowitzki, averaging just 5.9 points this year, scored the game’s first five points. In the opening 3:30, he tallied 11 points, the crowd seeming to enjoy the next bucket as much as the previous. Doncic, meanwhile, controlled the flow of the game. He seemed to make the right decision every time down the floor. He sprayed three three-pointers in the opening quarter. In the first seven minutes, he had 11 points, six rebounds, and three assists. He was the best player on the floor. Doncic put together a triple double, finishing with 23 points, 11 assists, and 10 rebounds. But this night, like many of the others in Dallas’ losing season, was about Nowitzki. Before the second quarter started, Steve Nash — former teammates with Nowitzki — was interviewed on the video board. He said he remembers Nowitzki scoring his first NBA points in Oracle Arena. The crowd gave Nowitzki a standing ovation. The bulk of Nowitzki’s production came in the first half, but a three-pointer early in the fourth quarter, then another mid-range make a couple minutes later, drew loud ovations — from what remained of a subdued Oracle crowd. Nowitzki’s final game in Oakland was his season’s best: 21 points — in his 21st NBA season. You could argue Cousins’ play and continued integration into the Warriors lineup is the most important storyline for the rest of the regular season. Sure, the Warriors are competing for the No. 1 seed, but their players have continually said they don’t need the top seed. They didn’t last year. Cousins has steadily returned to All-Star form. Entering Saturday, Cousins averaged 18.2 points, 8.6 rebounds, 3.8 assists, 1.9 blocks, and 1.2 steals in his previous nine contests. On Saturday, he went 8-11 from the floor with 19 points, six rebounds, and three assists. The Warriors sat Cousins for two games on their most recent road trip so he could rest his sore foot. In two games since returning, Cousins has looked refreshed. He simply gives Golden State something it has never had in a center, including outside scoring, inside scoring, tremendous passing, and soft hands, all wrapped into one.